If you’ve ever thought of it at all, you might have thought pumping water is simple. Hook up a pump to a couple of hoses, turn it on and away you go. Nothing could be further from the truth. Pumping water, especially large volumes over long distances, is a science and an art that involves atmospheric pressure, volume and flow calculations, something called friction loss and much more besides. To get the right pump – or series of pumps – for the job, you have to take all these things into account. It’s a science that has been at the heart of Ketek’s skillset from the beginning, and it’s a skill we are proud of and that we continuously strive to improve on. Pumps work in two ways. When a pump is turned on it creates a vacuum. Nature, which abhors a vacuum, searches for a way to fill it. If the pump is connected to a suction hose and the other end of that hose is immersed in water, the weight of the atmosphere pushing down on the surface of the water will force it into the hose and up to the pump. The impeller in the pump will then push the water further along the discharge hose. 1. As you may remember from high school science class, the weight of the atmosphere pushes down on the surface of the Earth. 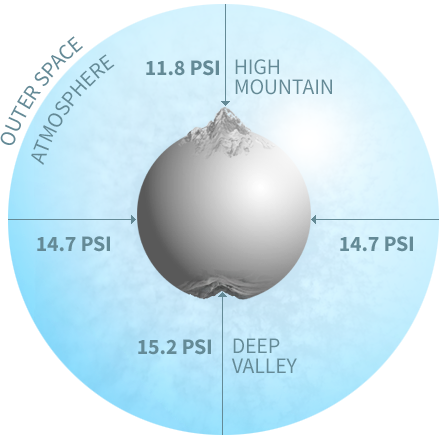 If the planet’s surface was perfectly round, the atmospheric pressure (at sea level) would be 14.7 pounds per square inch (PSI) everywhere. But it’s not, so atmospheric pressure changes with altitude. 2. It increases at low elevations (where there is more air above you) and decreases at high elevations (when there is less air above you). Determining the right pump means using the right PSI in your calculations. 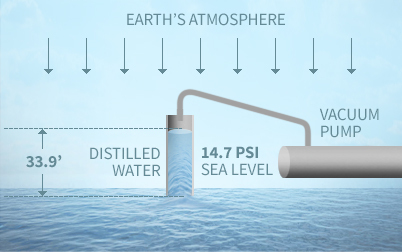 At sea level, atmospheric pressure of 14.7 PSI will force a column of distilled water to rise 33.9 feet in a vacuum. 3. Distilled water is water that has been boiled into vapour and condensed back into liquid in a separate container. Impurities in the original water that did not boil remain in the original container. Of course, water to be pumped is never distilled – it’s usually coming from a river or lake or from an underground well. So the rule of thumb is that most pumps can lift water 20 feet. 4. But even that calculation is just a beginning, as the pumps actual efficiency will be affected by other factors like temperature, humidity, suspended solids in the water and the inability of the equipment to create a perfect vacuum. Then you must consider friction loss. Friction loss is the loss of pressure or “head” that occurs in a pipe because of the water’s viscosity near the surface of the pipe. As the water tumbles and churns through the pipe, it encounters resistance both from other water molecules and from the sides of the pipe, which might be relatively rough. Head is not quite the same as pressure (PSI), although the two are related. Head is the height to which a pump can raise the water. It takes into account suction conditions and friction loss and ultimately determines the pump’s capacity to do the job. If you have to pump water up 30 feet and your pump doesn’t have at least 30 feet of head, it won’t work. Doesn’t the size of the pipe matter? When it comes to lifting water using atmospheric pressure, the size of the pipe doesn’t matter. A larger pipe holds more water and more weight, true, but the force pushing the water up the cylinder has nothing to do with the volume of water in the pipe. Submergence refers to the depth of the suction hose. Vortex refers to a mass of whirling fluid such as a whirlpool. Proper submergence is needed to prevent vortexing, which can make the pump lose prime, reduce head pressure and flow rates, lower efficiency, cause noise and possibly result in cavitation. Cavitation is the formation of pockets of vapour in a liquid. The implosion of those air pockets creates a shockwave we refer to as cavitation, which causes damage to the pump surface. This is a serious problem and a potentially dangerous one. Excessive cavitation can cause the impeller casing to be breached, essentially exploding and sending metal shards flying. Every pump is unique and requires an experienced and knowledgeable operator. These are powerful machines and improper operation can be dangerous and lead to serious personal injury. Pump operation can be particularly tricky in cold climates, where snow and ice buildup can cause serious problems. Most centrifugal pumps are not self-priming, meaning they must be filled with water before being started. If the pump casing is filled with gas, it will not function. The suction hose of a well-primed pump will be watertight with no air bubbles. Air in the suction side may cause cavitation. A pump curve is a graphical representation of the performance characteristics of a pump under stated conditions. A pump curve graph is used to determine which pump will meet site and client requirements. 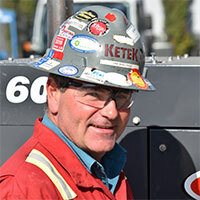 For complex jobs, where multiple pumps are required to get the water from source to destination, Ketek will prepare a profile of the entire job. 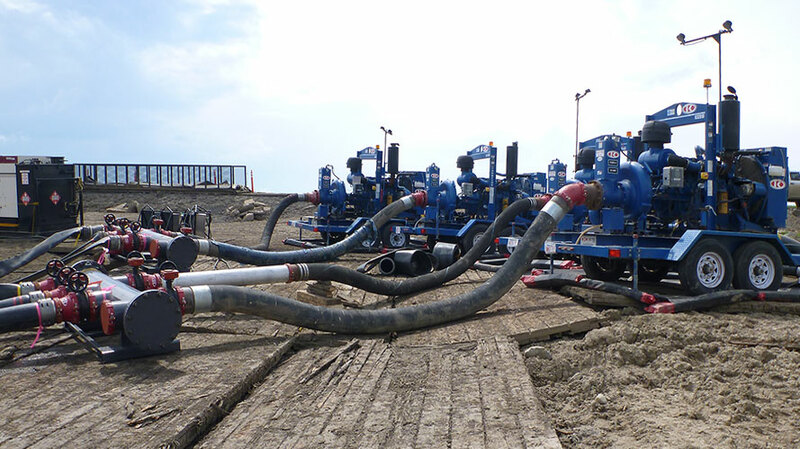 Ketek recently completed an 18-kilometre installation requiring 27 pumps. Think of each pump as a runner in a relay race. As one pump is almost exhausted it passes the water to the next pump, which is fresh! You don’t want the pumps to be too close together or else you’re wasting energy. Nor can they be too far apart or else the water from the last pump won’t get there. You have to do the calculations for each pump, taking into account, among other things, friction loss and the elevation changes between them. Ketek has the knowledge and experience to determine which pump, or pumps, are right for the job. Check out our selection of pumps or call us anytime.